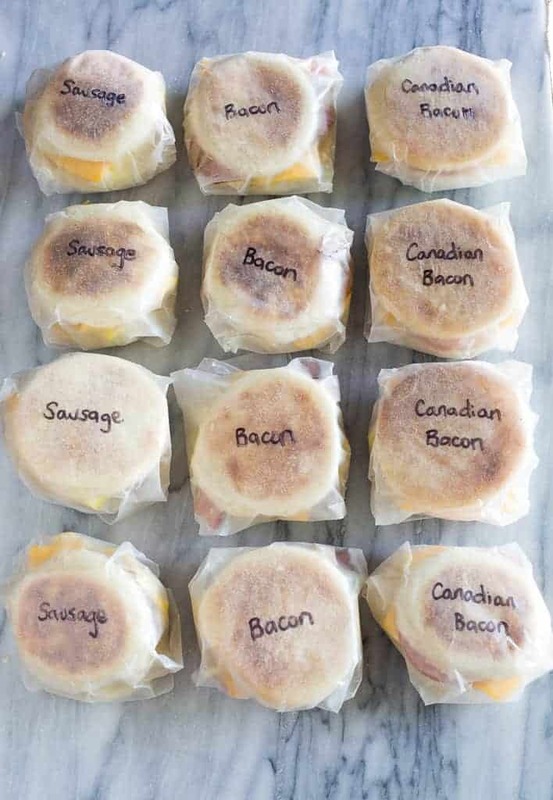 Freezer Breakfast Sandwiches made with baked eggs and topped with cheese, sausage, bacon, or ham on an English muffin. These make ahead sandwiches are easy and delicious. Making meals ahead of time is one of the bests gifts you can give yourself. 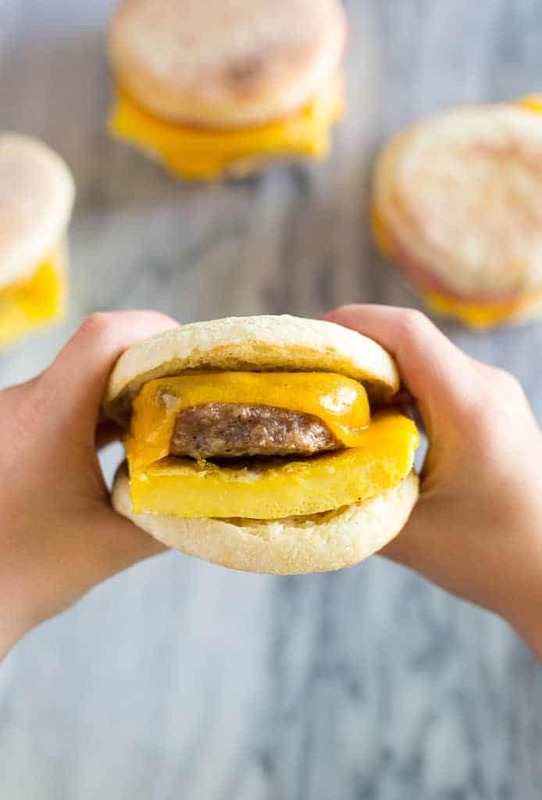 You will thank yourself each time you reheat one of these Freezer Breakfast Sandwiches. Check out my other Freezer Friendly Recipes like these Swedish Meatballs and Homemade Crepes! These make ahead Freezer Breakfast Sandwiches are something that I have wanted to perfect for awhile now. I worried they might not live up to the hype, but boy was I totally wrong! 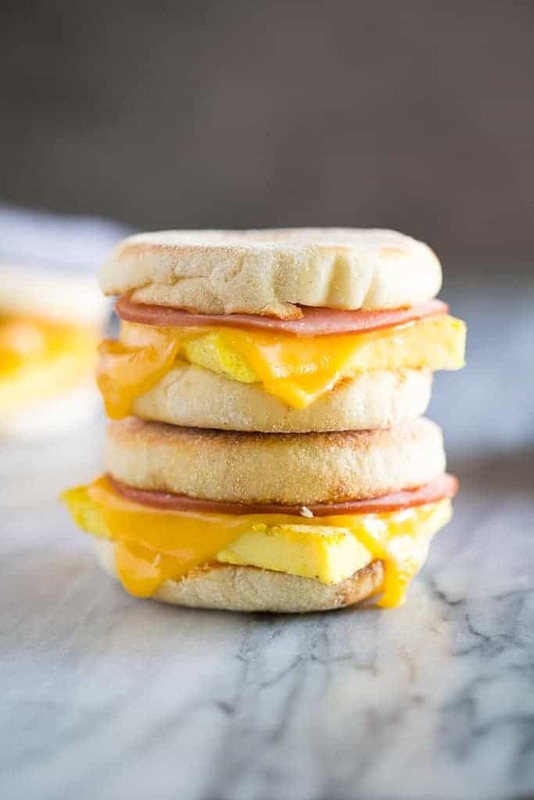 Seriously, these breakfast sandwiches are not only delicious and simple, but they store wonderfully in the freezer and still taste great after rewarming them. Another thing I wanted to point out is that you can definitely customize them. 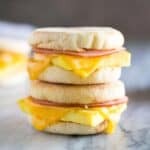 I make my freezer breakfast sandwiches with an english muffin because I think english muffins store best in the freezer, and my family loves them. You could also try making them with bagels, or sandwich thins. Also, if you wanted to make them healthier there are so many ways to do this. I have a whole section (see below) with ideas of how to make healthy freezer breakfast sandwiches. Prepare the eggs: Whisk the eggs, milk, salt and pepper and pour the egg mixture into a greased 9×12 pan. Bake: Bake for 18-22 minutes, or just until the center is set. When baking the eggs, make sure not to over-cook them! You want the center to be just barely set. The eggs will get cooked more when the breakfast sandwiches are reheated, so we want they’re texture to still be good, and not overcooked. 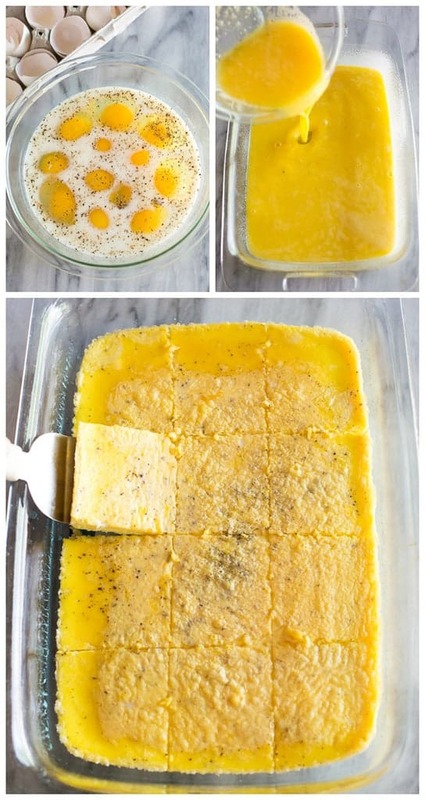 Allow the eggs to cool and cut them into 12 squares. 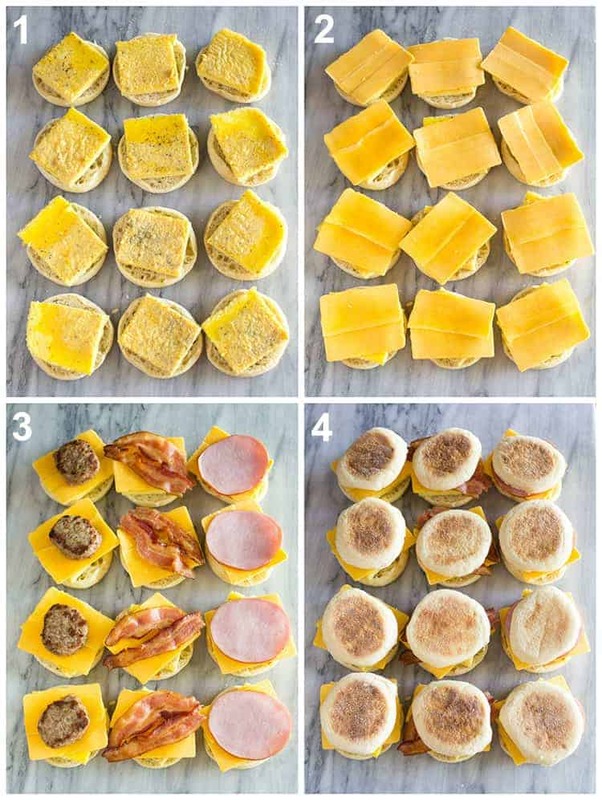 Assemble: Top each English muffin half with egg, cheese, and meat. Eat or Freeze: If you are consuming your breakfast sandwich right away, heat the sandwiches at 350 degrees for about 5 minutes or until the cheese melts. If you are freezing your breakfast sandwich, wrap each sandwich individually in wax paper, parchment paper, or tinfoil and place them in a freezer safe resealable bag. Freeze for up to 1 month. Remove the plastic wrap and wrap the sandwich in a paper towel. Microwave for 1 minute on defrost or 50% power. Flip the sandwich over and microwave for 30 seconds- 1 minute on high power, until warmed through. You could also reheat these freezer breakfast sandwiches in the toaster oven or regular oven. My family even likes to bring them camping and reheat them over the campfire! There are so many variations you can use to make these freezer breakfast sandwiches healthy! Switch to whole grain bread. Switching to whole grain will add fiber which helps our bodies regulate digestion, lowers our risk for obesity related diseases, and helps you feel full for longer! When preparing your eggs, add vegetables! Add any vegetables you like to the eggs before baking, including: mushrooms, onions, peppers, spinach, zucchini, etc. Adding vegetables will also add valuable vitamins, minerals, and fiber and it will help the sandwich feel even more hearty! Use egg whites. You could cook your egg bake with egg whites only! This will help lower the cholesterol content and overall calories or your freezer breakfast sandwich. If you are using this method, you will want to add a few more egg whites than called for. Swap out the meat. You could swap bacon for turkey bacon, sausage for turkey sausage, or forgo the meat entirely! Laur, these look so great!! Is that really only 2T of milk in with the dozen eggs? It looks like more, and I use a higher ratio when making standard scrambled eggs with added milk. Hey Tiffany, you can use more milk if you want to but as I’ve tested them I noticed that with more milk, the texture of the frozen eggs once they were reheated was better with less milk–not so “spongy”, if that makes sense. Hope you enjoy them! You’re totally right. I guessed at my normal amount and the eggs turned out very spongey. I think they’ll taste fine..? (: My bad! Made a big batch this weekend and just reheated my first this morning. So GOOOOOODDDDD! A true life saver.